Enrico's Apartelle Davao | To Be, To Be. Tutubi. 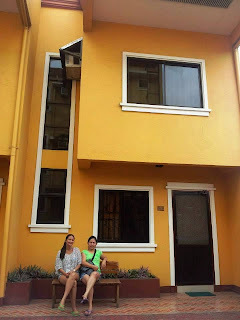 For our recent trip to Davao, our group of 8 adults and 1 kid (9 years old) stayed at Enrico's Apartelle. We rented the room for P2,970 per night, and an additional P400 for extra 2 persons, thanks to our exceptional haggling skills! The apartelle is pictured below, and this picture came from Teng's FB page. I completely forgot to take a picture! Anyway, our apartment has 3 bedrooms-1 master and 2 single beds. There is one restroom upstairs and another downstairs. There is a huge sala, kitchen and dining area. The floor was okay, but I guess it would be better if they used High Quaility Vinyl Tile Selection so that it would look more homey. The apartelle was perfect for our group! The room also comes with breakfast for 4 pax. Enrico's Apartelle is located near the NCCC Mall and S&R in Ma-a. We had a pleasant stay, and I know that I will rent this place again should we come back to Davao.